Is mercury in fish as harmful as you thought? I’m sure you’ve heard you should be eating seafood twice a week because it’s low in calories and fat, packed with protein and certain oily varieties, such as tuna, salmon and sardines, are a good source of healthy omega-3 fats, which have been shown to improve heart health and your mood. When it comes to which fish to choose, as a nutritionist and woman “of childbearing age,” I’ve always heeded the advice the Environmental Protection Agency (EPA) gives to kids, women who are, or could become, pregnant and nursing women, to avoid eating shark, swordfish, king mackerel and tilefish and to limit albacore tuna to 6 ounces a week. Why? 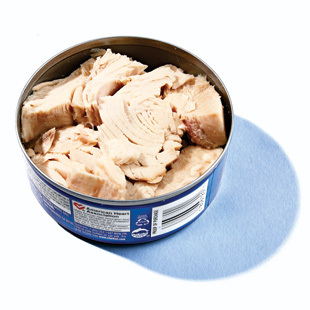 A common concern when choosing seafood is mercury. And for good reason: in unborn babies, infants and children, mercury can impair neurological development. Here’s how: mercury binds up selenium, which is an essential mineral that’s vital to developing brains and nervous system. In adults, mercury poisoning can hinder neurological function. Turns out, though, that eating ocean fish that contain more selenium than mercury protects against mercury toxicity. Ocean fish (e.g., halibut, salmon) and shellfish (e.g., lobster, crab) are chock-full of the mineral: 17 of the top 25 selenium food sources are seafood. (Selenium is also found in red meat, eggs and chicken.) The fact that most ocean fish are so high in selenium explains why more and more research suggests the benefits of eating seafood outweigh any risks mercury exposure could pose. But do I (and you) really need to be avoiding those fish altogether?